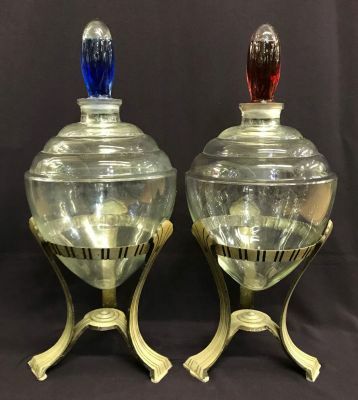 Art Deco apothecary jars with original stands, American, circa 1930s. The bottles and stoppers are glass sitting on galvanized metal stands. The stoppers are hollow and were designed to be used to hold liquid independently of the bottles. 23” high, 9 1/2” diameter.